Hello, I have these plants pop up from the containers that filled with compost. Could you please tell me if it is edible or a weed. Thanks a lot. From the photo you have submitted, this plant appears to be Solanum ptycanthum, Eastern Black Nightshade, or perhaps Solanum Nigrum, Black Nightshade. The former is a native herb found throughout southern Ontario, the latter is a naturalized herb. 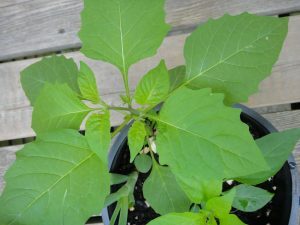 These annual nightshade species are considered to be major weed problems in many agricultural crops in Ontario and can be found everywhere from waste lots to road verges, farmers’ fields to gardens. All parts of the Black Nightshade contain toxic glycoalkaloids: the unripe berries contain the greatest concentrations – enough to kill small animals, even children. Eastern Black Nightshade is less toxic– its unripe berries may contain less harmful levels of glykoalkaloids. Below are a couple of websites that you can use to compare your plant to the photos. The Ontario Ministry of Agriculture states that Eastern Black Nightshade can be confused with another common weed, pigweed, Amaranthus spp. You may find the third website below useful for comparative purposes. The short answer is this: if you cannot identify a plant that has popped up in a planter from compost, but you know that you haven’t planted it, it makes the most sense to pull it and dispose of it.